1. On a server with the DHCP Server Tools installed, click the Server Manager tile on the taskbar. 2. When the Server Manager console opens, click Tools, and then select the DHCP option. 3. 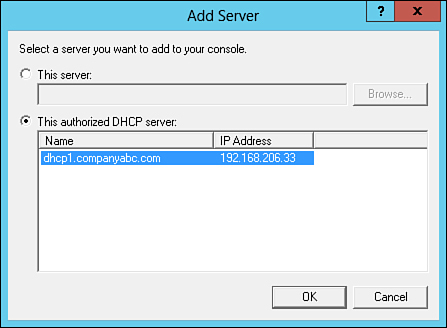 If no servers are listed when the DHCP console opens, right-click DHCP in the tree pane and select Add Server. 4. In the Add Server windows, if the server is already authorized, select it from the Authorized Server section of the window and click OK, as shown in Figure 3. If the server is not yet authorized, type in the server name, and then click OK to continue. Figure 3. Selecting an authorized DHCP server. 5. After the server is added to the console, expand the server to reveal the IPv4 and the IPv6 nodes. Verify that both nodes show a green checkmark indicating that the server is properly authorized in Active Directory. 6. Select the IPv4 node, and then right-click and select New Scope. 7. Click Next on the Welcome to the New Scope Wizard. 8. On the Scope Name page, provide a description name and description for the new scope, and then click Next to continue. 9. On the IP Address Range page, enter a starting and ending IP address and a corresponding subnet mask for the new scope, and then click Next to continue, as shown in Figure 4. Figure 4. Defining the new scope IP address range. 10. On the Add Exclusions and Delay page, enter any IP address exclusion ranges or DHCP subnet delay intervals, and then click Next to continue. DHCP administrators wanting to deploy redundant servers or split-scope ranges should leave the fields on the Exclusion and Delay page blank and run the Failover or Split-Scope Wizards to achieve the desired redundancy configuration. 11. On the Lease Duration page, adjust the lease duration from the default of 8 days to the desired IP address lease duration and click Next to continue. Typical durations include 1 day, 8 hours, or 30 days, depending on the organization. 12. On the Configure DHCP Options page, select the Yes I Want to configure Options Now radio button and click Next to continue. The wizard then steps through the configuration for the most common DHCP scope options that administrators desire, such as the Router (Default Gateway) option, the Domain Name Suffix & DNS Servers, and WINS Servers. 13. On each of the options pages, enter the appropriate information and click Next to continue, as shown in Figure 5, when configuring the domain name suffix and the DNS servers. Figure 5. 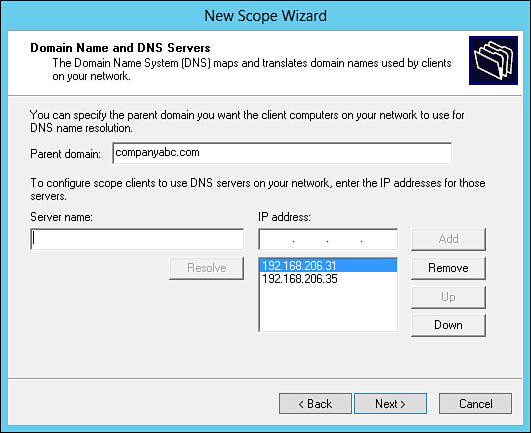 Configuring the default domain name and DNS server IPv4 DHCP scope options. 14. On the Activate Scope page, select the Yes, I Want to Activate This Scope Now radio button, and then click Next. 15. Click Finish on the Completing the New Scope Wizard page. 16. After the scope has been created, expand the IPv4 node to reveal the new scope and review each of the subnodes to ensure the correct settings were deployed. This completes the deployment of a new IPv4 DHCP scope.